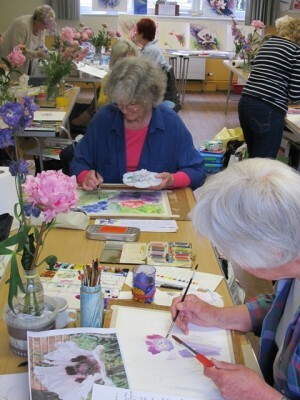 Started in Haslingfield in 1983 by Peggy Williams with like-minded friends, the Cambridge District Art Circle (CDAC) has grown to serve an important function in the region with over 100 members. The aims of the society is to encourage interest in painting, achieved through the provision of regular demonstrations, talks, workshops, tutorials, competitions, social events and a well-stocked library of relevant video material. There is a public exhibition each year, usually at Grantchester Village Hall over the August Bank Holiday weekend, supported by a tea-shop serving drinks and home-made cakes. 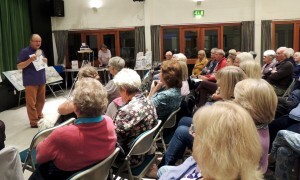 Regular monthly meetings and demonstrations (usually by well known local and national artists) are held in Haslingfield Village Hall (2nd Wednesday of each month). These demonstrations are inspiring, engaging and highly popular amongst the members. New members are welcome. Annual subscription is £18. Further information about CDAC and about membership can be found here.